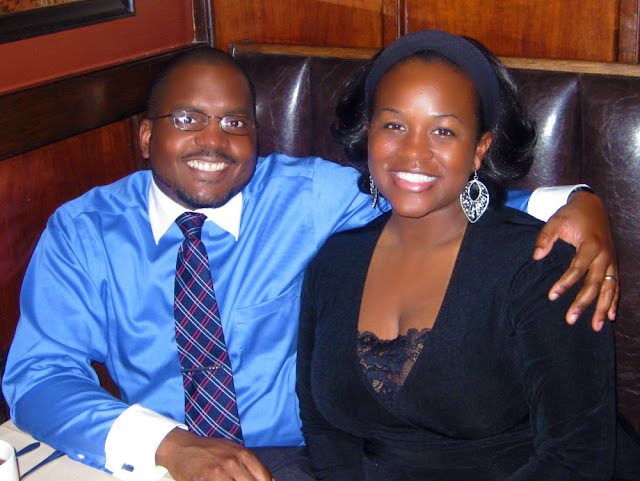 My husband and I celebrated our fifth wedding anniversary on Saturday, March 6th. We had a fantastic dinner at Harry's Savoy Grill, which is adjacent to Harry's Savoy Ballroom, where our wedding and reception were held back in 2005. 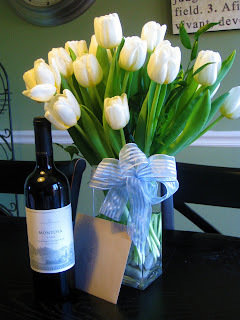 The fun weekend started when my father sent white tulips to my office as an anniversary gift. I also gave my husband a bottle of his favorite vino. Of course, the best part of the weekend was dinner at Harry's. They never disappoint. My husband planned a fantastic evening. We were seated in a cozy corner of the dining room. He even had roses delivered to our dinner table. I started off with herb and ricotta gnocchi with Brussels sprout leaves and a flight of international Sauvignon Blanc. My entree was Seared Sea Scallops with Prosciutto, Snap Peas, and Figs with a Balsamic Reduction. Oh yes, it was very, very good. The scallops were soft, but not too raw. I don't like overcooked seafood, but I also don't care for a translucent look and rubbery texture. These were perfect. The snap peas were cut into bite-sized pieces and they were barely cooked, just the way I like them. They were crunch and were a nice contrast with the soft, sweet figs, and the thinly sliced salty prosciutto. I used to think I didn't like figs, but I realized that I don't like Fig Newtons (yuck! ), but that fresh figs are excellent with cheese and other savory dishes. I was (and still am) very, very happy. My mom surprised us with an anniversary cake from the bakery that created our wedding cake. It was my favorite flavor (and the same flavor as the top layer at our wedding): fresh strawberries and cream with whipped icing. We had such a rich dinner that we're going to wait until dessert tonight to enjoy the cake. As a bonus, we even had good weather. After all our blizzards and snowstorms, the temperature is over 50 degrees this weekend. For the first time in months, I was able to dress up and go out without wearing thermals, tights, or boots. It's nice to take time out to have great celebrations, especially when your day to day life is so hectic and stressful. Great dinner, great husband, and a great family. I'm a happy woman. You guys are too cute! I love that we have the same anniversary. We went to a little restuarant that used to be a bank that was built in the early 1900's. The room that used to be the vault was transformed into a private dining room for 2. It was really nice. We both had steaks and we shared Bananas Foster. yum! We didn't exchange gifts this year but we did write eachother love letters. Cheesey I know!, but so fun. Happy Anniversary to you and your hubby. I wish youa lifetime together! i'm really hungry right now. 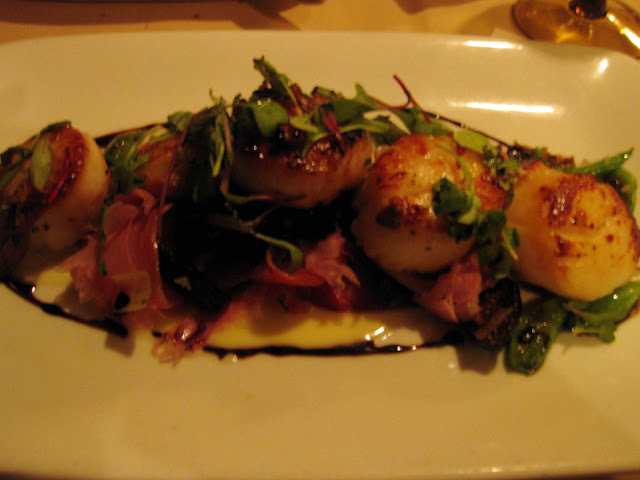 and those scallops look A-MAZING. 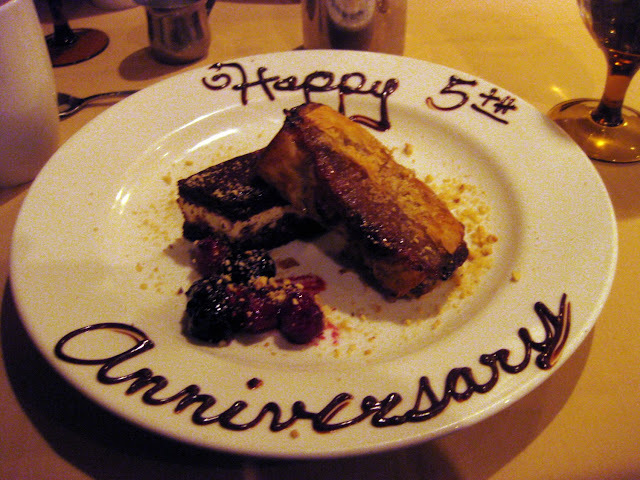 congrats on 5 years and many more to come! hoping that's me one day in the future! 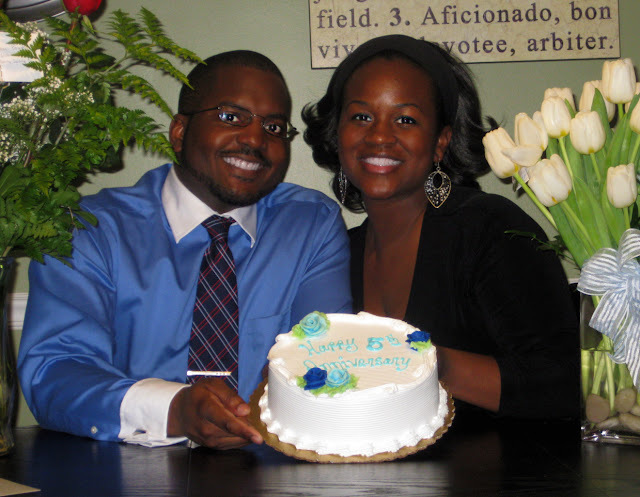 AWW Congrats on 5 years of wedded bliss! It's lunch time and looking at that food has my stomach crying out louder than usual.. people are staring! You guys look wonderful together. That was super thoughtful of your hubs and parents!